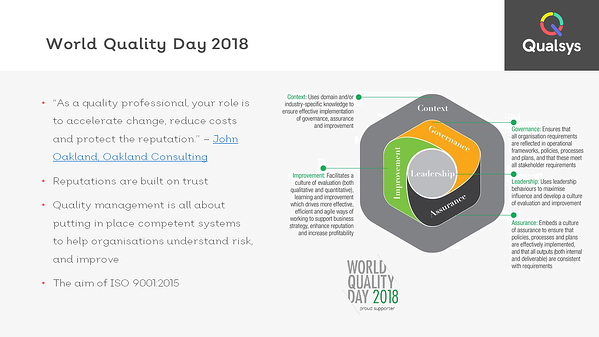 Kate Armitage, Head of Quality Assurance at Qualsys, ran a live ISO 9001:2015 Q&A webinar to celebrate World Quality Day on 8 November 2018. Kate is a member of the BSI standards committee with over 15 years’ experience in managing governance, risk and compliance. Kate trains Qualsys customers to ensure their systems, processes and procedures are compliant and standard-centric. "How do I document the context of my organisation?" "How do I get my colleagues to adopt the ISO process approach?" "How do I get leadership to demonstrate commitment to the QMS?"